In a meeting with Egyptian President Abdul Fatah Sisi on Sept. 19, Donald Trump expressed his solid support for Egypt’s war on terror and said a Trump administration would be “a loyal friend” to Sisi. 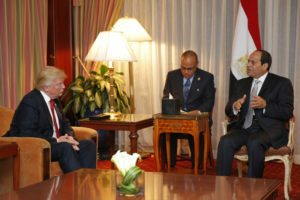 The high-level meeting in New York City focused on political, military and economic cooperation between the U.S. and Egypt, according to a readout of the meeting released by the Trump campaign. “Mr. Trump emphasized to President Sisi his high regard for peace-loving Muslims and understands that every day there are people of goodwill that sacrifice their lives and fortunes to combat the growing threat of radical Islamic terrorism,” the campaign’s release said. The GOP presidential candidate also reportedly said that if Trump wins in November, the Egyptian president can expect an invitation for an official visit to the U.S.
Top advisers Sen. Jeff Sessions, Alabama Republican, and retired Lt. Gen. Michael Flynn joined Trump for the bilateral meeting. Meanwhile, Hillary Clinton met with Sisi as well as Japanese Prime Minister Shinzo Abe and Ukrainian President Petro Poroshenko. The world leaders are in New York for the United Nations General Assembly.